Description This ancient temple located in Kanyakumari district, on the railroad between Kanyakumari and Tiruvanandapuram, has been glorified by a decad of 11 verses composed by Nammalwar in the first millennium CE. . The architecture here, as with several other temples in Kanyakumari district resembles that of the Temples of Kerala. Worship protocols followed here are also the same as those of Kerala. This temple is an important center of worship and is referred to as Aadi Anantam and Dakshina Vaikuntham. Tiruvattar is referred to in the Sangam period tamil work Puranaanooru. The deity Aadi Kesava Perumal in a reclining posture faces west. As in Tiruvanandapuram, the deity is viewed through three openings in the sanctum. The sanctum has been designed so that the rays of the setting sun illuminate the face of the deity. Legend has it that Vishnu vanquished the demons Kesa and Kesi ,(hence the name Aadi Kesan) and took abode on the coils of Aadi Seshan here at Tiruvattaar. Kesi took on the form of the Tamraparani river. Shiva is believed to have taken on 12 forms to witness the battle between Vishnu and Kesi, and worship Vishnu. A pilgrimage to all of the 12 Shiva temples is considered complete after visiting this temple at Tiruvattaar. The temple: The sanctum faces west, although the main entrance is on the east. The temple stands at an elevation and is surrounded by fort like walls. A majestic towered entrance is reached through a flight of steps. There are also shrines to Adi Kesava, Venkatachalapati and Taayaar. 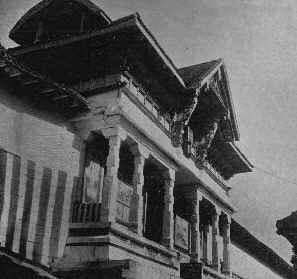 The flag staff of copper was built by the Travancore royal family. The circumambulatory passage around the sanctum (Sri Balippuram) is lined with 224 granite pillars, each one of which carries sculptured images of Deepa Lakshmi. Interestingly, no two of these images are alike. The balipeetha mandapam has life sized images of Lakshmana, Indrajit, Nataraja, Vishnu and Bhrama, Rathi and Manmathan. The sanctum has beautiful wooden carvings. There is also a shrine to Tiruvambadi Krishnan. Inscriptions from the period of Rajendra Chola (early 11th century CE) are seen in this temple. In front of the sanctum is the Udaya Maartaanda mandapam with ornate woodwork. Mention must be made of a carving of Ganesha, and that of Shiva engaged in tandavam. The temple is constructed in such a manner that the sun's rays fall on the feet of the deity's image from the third to the 8th day of the tamil month of Panguni and on the 3rd and the 4th days of the tamil month of Purattaasi. There is incredible similarity between this temple and the Anantapadmanabhaswamy temple at Tiruvanantapuram. It is even said the Tiruvanantapuram temple was built after this temple. As with the Padmanabha temple at Tiruvanantapuram, the deity is represented as an imposing image of Vishnu in a reclining posture viewed through three doors. There are some differences in iconography of this image between the two hoary shrines. For instance, the Shivalingam (Kasi lingam) is seen near the head of Vishnu's image at Tiruvanantapuram while it is seen near the feet here. Also, the presence of Bhrahma on Vishnu's navel is a feature that is absent here unlike Tiruvanantapuram. Representatives of the maharaja of Travancore accompany processions at Tiruvattar, symbolizing the living link between the Travancore royalty and the Tiruvattar temple. The image of Garuda in this temple is made of gold inlaid with precious stones and is taken out in procession in the tamil months of vaikasi and aippasi. Festivals: The Kerala tantram is the protocol of worship conducted here, by Namboodris of Kerala. Four services are offered each day. There are two annual festivals, the first one in the month of Aippasi, where the Teerthavari (Aarattu) is held in the river Tamraparani near the Shiva Tali. The Golden Garuda Sevai is held during both these festivals. Krishna Jayanthi, Vaikuntha Ekadasi, Aavani Tiruvonam, Kalabham in the month of Thai, and the Perunthamritu poojai (Aadi and Thai) on the eve of the summer and winter solstices are some of the festivals celebrated here. The utsava images are taken out in procession every day. Legend hs it that an army of invaders from North India, were miraculously turned away by a swarm of wasps, in answer to prayers by the Maharaja of Kottayam (17th century). Legend also has it that the festival image was stolen by the armies of the Nawab of Arcot in the 18th century and that a mysterious ailment which gripped the Nawab's wife was cured, only after he returned the image to the temple. A special service by name 'tiru Alla Poojai' is offered suring the annual festivals here. It is also believed that the festival image being returned by him, got stuck to the ground near the Shiva temple, and that it came unstuck only after a decision was made to carry out the Aaraattu near the very spot.